Everybody goes to the Accademia Gallery to see Michelangelo’s David. I can’t blame people for this, of course, but I can advise that if you have enough time and can contain your enthusiasm for 15-20 minutes, you won’t miss out something incredibly interesting. Entering in the Accademia Gallery, if you immediately go to your right, you will walk through a corridor to reach the musical instruments section, featuring the most precious instrument in the world: the Medici Viola. The Medici Viola, also known as the Tuscan-Medici Viola, was built in Cremona by Antonio Stradivari and is dated 1690. It was originally made for the Grand Prince Ferdinando de Medici, fan of music, who had his personal group of musicians. The instrument was rarely played, because it was already obsolete when built: technological progress in musical instruments allowed to have smaller instruments getting the same sound. Many parts of old instruments were replaced with new ones, getting more efficient devices, and this is what makes the Medici Viola rare: it’s completely original. Now, if you think that any Stradivari violin (with replaced parts) is usually sold in auctions for a seven digits amount, how precious is the Medici Viola? 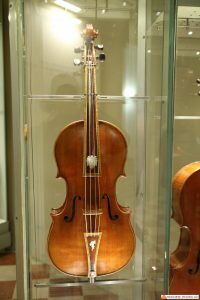 The Medici Viola, in 1863, has been donated to the Regio Istituto Musicale of Florence, now the Istituto Cherubini, where it has been from that point forward. The Istituto Cherubini is in the same palace as the Accademia Gallery and the collection of musical instruments, including the precious Medici Viola, has been permanently lent to the Accademia Gallery. There is a curiosity about the Medici Viola: the curator of the Istituto Cherubini, Giuseppe Scarampella (a lutist himself), in 1877 opened the Viola to check worm damage and found a patch with a note hand-written by Antonio Stradivari: “corrected by me, Antonio Stradivari”. Looks like the most famous lutist in history made a mistake, probably the Medici Viola belly was too thin and he had to repair it. Galleria dell'Accademia Tour, Florence - Skip the Line! Cool ! the actual pic is now fine !